Square’s efforts to please are equal parts hilarious and cringeworthy, and the moment he topples over in exhaustion is comic gold. The story’s decidedly ambiguous conclusion leaves the door open for questions about what it means to be an artist—and that’s the whole point. This book takes a sweeter turn from its prankish predecessor in that Square works hard to create something for Circle, only to feel like he failed; but when Circle sees what he created, she is “beguiled” once more by his genius. Though this title will stand alone, children familiar with Triangle might recognize the extra layer of humor at the end when an unnamed narrator poses a game-changer of a question. A must purchase that will satisfy old fans and create new ones. 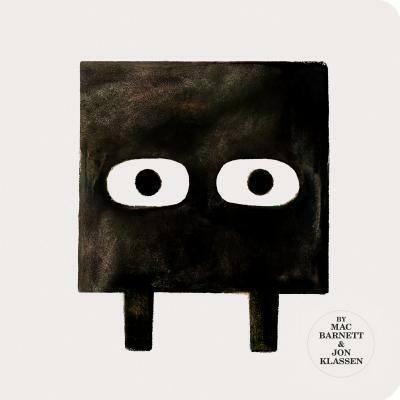 Funny and lightly philosophical, Barnett’s story gets an extra punch of hilarity with Klassen’s minimalist graphite-and-watercolor artwork. A must for Triangle fans that will leave them wondering how this geometric drama will end. With typically deceptive minimalism Klassen places a few flat, blocky shapes on the white pages to suggest the physical landscape, angling Square's body and glance to convey the emotional one. Humor is in the details: a bit of twig that catches on harried Square's head and stays there; the shadow that appears beneath Circle as she floats along through the air. For all its brevity, chockablock with philosophical topics to ponder and debate. Barnett’s text is funny and profound, raising philosophical questions about intent, genius, and truth. Klassen’s trademark eyes do a lot of emotive work amid the spare, fantastical set- ting. Angled lines (in the rocks, plants, and slanting rain) and white space direct readers’ own eyes across each page or spread, and short sentences, smart dialogue, and word repetition keep the story moving at a steady pace. Readers looking for a compelling read-aloud will not be disappointed. There’s a ’60s flair to this story of friendship and artistry; the text is spare yet robust, with a lot of meaning behind the carefully selected words, and the open-ended conclusion will give kids much to discuss. Klassen’s watercolor, graphite, and digital art is animation ready, with simple textured shapes against white backgrounds...While the story could provoke discussions about expectations and friendships, this title is most at home as an original entry in art curricula. Square attempts to make a Circle sculpture that will be as perfect as his friend is...Children will no doubt find the results hilarious. The droll illustrations by the Niagara Falls, Ont., native Klassen, in subtle shades of gray, brown and blue, endow these friends with personality and Barnett's simple text is perfect.